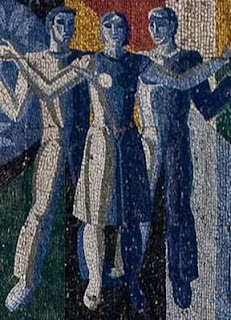 Via Calvert Journal, we are introduced to the determined documentation and conservation efforts of Dennis Keen to capture and preserve the Soviet murals, bas-relief and mosaic that adorned Almaty, the capital city of the Kazakh Soviet Socialist Republic, Russian appellation above. After the creation of an independent Kazakhstan, the capital was moved to Astana. Though importantly host to the Baikonur Cosmodrome which tied the far-flung republic to Mother Russia, there was yet the sentiment that “the mountains are high and the Emperor is far away” that needed these public displays as a reminder and to show that art was not the domain of the elite. Visit the links above to explore an outstanding gallery of civic monuments and architectural interventions that inform and reflect the city’s character.